The Lincoln & Welland Regiment is based in St. Catharines, Ontario, Canada. The Lincoln & Welland Regiment is our “family regiment” as both my Grandfather and Father served in it. Captain (?) 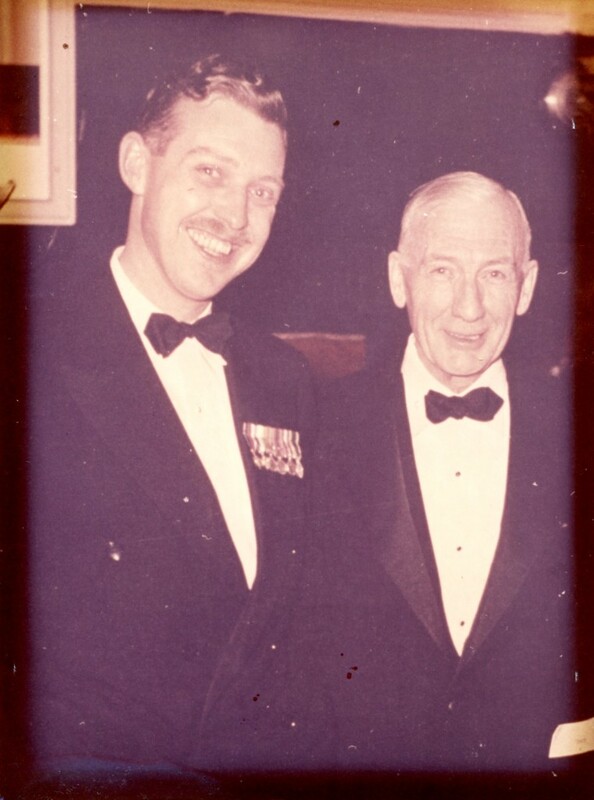 A.H. Stevens with his father W.A.Stevens in the Officers’ Mess at Lake Street Armoury in St. Catharines, Ontario. Late 1950s? 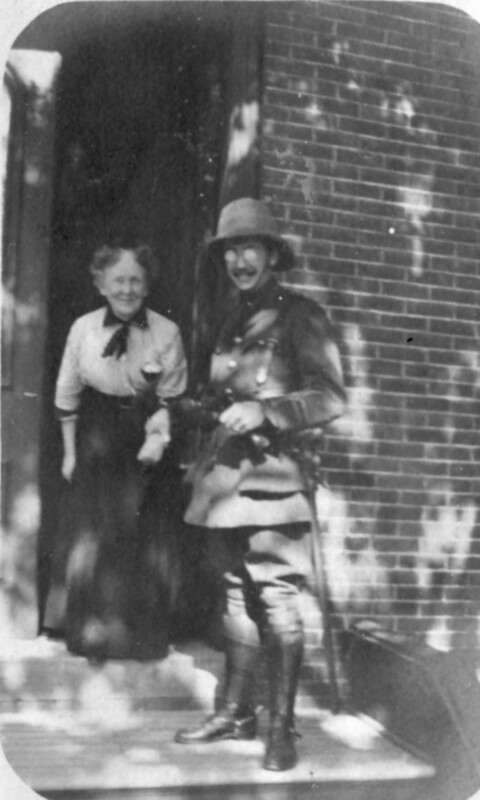 Captain W. A. STEVENS with his mother, Minnie (nee MacGREGOR about 1915, in St. Catharines, Ontario, Canada. In 1906 my Grandfather (William Arnott Stevens) joined the 19th St. Catharines Regiment , which became the 19th Lincoln Regiment, and later the Lincoln & Welland Regiment (named after the counties it recruited from). He served with the Lincs & Wincs until the 1950s. I have his uniforms, sword etc. from circa 1907. Brief history of the regiment. Click on small photos to enlarge them. Souvenir of Captain William Arnott Stevens. Donated by Colin Stevens to the Lincoln and Welland Regimental Museum. The handle is gold over a plaster core. Unfortunately the head was broken off by children playing with it. Donated by Colin Stevens to the Lincoln and Welland Regimental Museum. 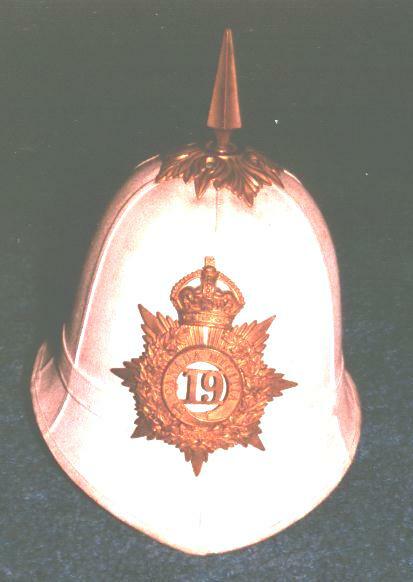 THE LINCOLN REGIMENT, King’s crown, painted brown, presumably for field uniform in 1920s. Mfg J. R. GAUNT & SON LONDON MADE IN ENGLAND. Shoulder or collar badges for the 19th Regiment – Ex-Captain W A Stevens. Owned by Colin Stevens. 19th Lincoln Regiment collar badge made by J. R. GAUNT, MONTREAL and LINCOLN shoulder title marked on back “ELLIS & CO LTD 1922” – Ex-Captain W. A. Stevens. Owned by Colin Stevens. The helmet and helmet plate that were given to me by Albert Earl O’Loughlin, formerly of the Lincoln & Welland Regiment. He could not remember if it was his or my grandfather’s (who was his brother-in-law). Neither of their names is in it however. Pencilled inside are initials (probably of a solider) “MOL” and “AW”. Maker’s stamp is CHRISTY’S LONDON (circular rubber stamp). Red “21” on white paper glued inside above capital letter “R” inside a circle. Inside sweatband is the number 4 over an X. The helmet plate is still held on as it was originally by matchsticks! The helmet is missing the chinstrap, thought strangely enough, my Grandfather saved his chinstrap (Officer’s with golden linked chain over leather) and two helmet spikes! I have these also. His brother-in-law (Eric Gardner) also served in the unit and commanded one of the battalions. I had a 19th Regiment pre-WWI greatcoat that I donated to the Lincoln and Welland Regimental Museum. Jacket crest for the Lincoln & Welland Regiment, from the effects of Lieutenant Arnott Hume Stevens. Probably dates from 1939-1942. Owned by Colin Stevens. Lieutenant A H Stevens, Lincoln & Welland Regt. in Newfoundland circa 1942 with his Harley-Davidson WLC. My father Lieut. Arnott Hume (“Pete”) Stevens (1919-1985) joined up with them in the 1930s as a drummer boy and in September 1939 was Adjutant, and he swore in many of the soldiers. He did not have a bible handy as I recall him saying so he used another book for the swearing in ceremony, and later joked with some of the veterans that they were not ‘legally’ ever sworn into the army! Dad also went with the Lincoln & Welland Regiment to Nanaimo, BC and later overseas with them to Newfoundland. In Newfoundland he was appointed as Aide de camp to General Page, the General Officer Commanding the Canadian Army in Newfoundland. Interestingly, Dad’s future wife’s uncle, Air Vice Marshall F. Vernon Heakes, was the Air Officer Commanding in Newfoundland about this time. In 1943 Dad transferred to the Essex Scottish after the Dieppe Raid (Aug 42) as they had lost their officers in the attack and Dad wanted to see action. He was later wounded in action while attached to No. 4 Commando in late 1943. Lieutenant Colonel Arnott Hume Stevens wearing his ‘mess kit’ of the Lincoln & Welland Regt. After the war he became a doctor and rejoined the Militia and rose to the rank of Lieutenant Colonel in the Royal Canadian Army Medical Corps, though he retained his loyalty to the L&W as you can see by the collar dogs on his mess kit. My parents were married at Basingstoke England on March 17, 1945 while dad recuperated from a wound and mom was a Canadian army nurse. Dad was in the Lincoln and Welland. He eventually commanded the regiment after the war and was the former commanding officer who laid a wreath on Pte. Howie’s grave in 2000. You may have seen him in news clips during that time.